You may have seen the church signs, attended Muslim or Hindu prayers, handed over a loonie for a glass of Shoal Lake water at the fringe festival or signed one of many petitions. Perhaps you ponied up a buck or two for the online fundraising campaign that garnered $75,000. Or maybe you’ve sent a political card to Ottawa or a thank-you note for a century’s worth of fresh drinking water. 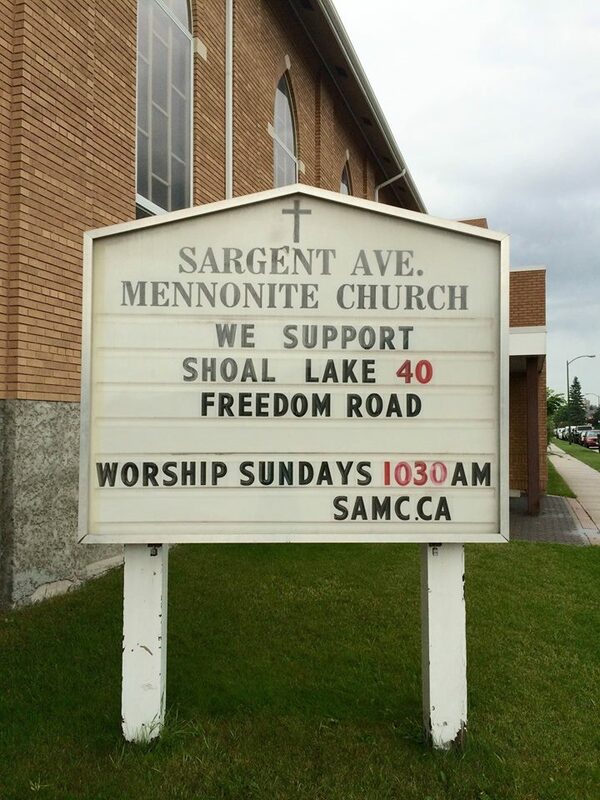 In the last couple of weeks, churches, cultural groups, evangelists and people from all walks of life are driving a groundswell of support for Shoal Lake 40. The First Nation lost a link to the mainland when an aqueduct was built to carry drinking water to Winnipeg. CUPE, the city’s biggest labour union, jumped aboard the campaign to have a road built to the First Nation, this week. Below the surface, a long slow simmer is coming to a roiling boil on a historic issue, and three key figures are pushing the wave. West Broadway Community Minister Lynda Trono spearheaded the 10 Days for Shoal Lake campaign. Christian singer-songwriter Steve Bell got together with Mennonite leaders to start an online petition and a church photo poster that will go to every MP. Winnipeg broadcast journalist Rick Harp created a crowd-sourcing platform. The campaigns are separate but they sprouted up within a day or two of each other. Their goal is to get Shoal Lake a road to the mainland and a safe source of drinking water. The websites show support cuts across partisan lines and includes celebrities and ordinary people. “It just seems like a clear open-and-shut case, like here’s justice we can commit to and it’s so singular and indisputable,” Bell said. 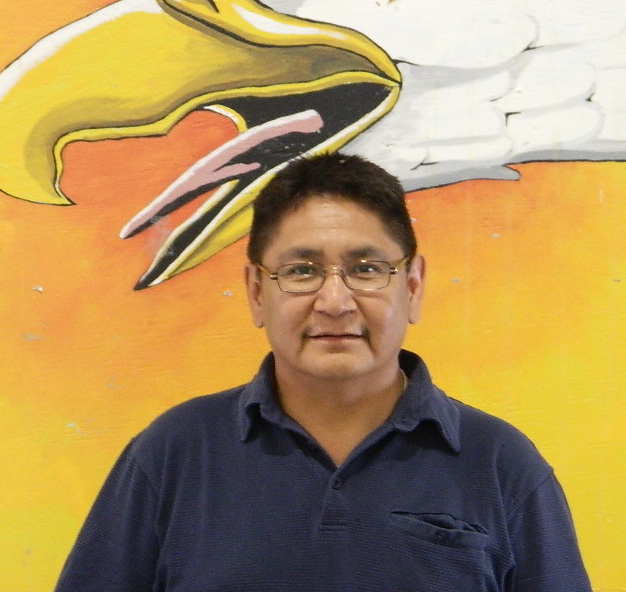 Chief Erwin Redsky of Shoal Lake 40 said Thursday the surge seemed to happen overnight, and a lot of it is heartfelt. “I was touched and overwhelmed by the amount of people who are catching the story and supporting us. Steve Bell called me personally. I continuously get letters from kids in Winnipeg… thanking us for their water,” he said. Bell said the kudos belong to Amy Knight and a group of friends that include his sister, Dorothy Fontaine, the wife of Vince Fontaine of the music duo Eagle and Hawk. 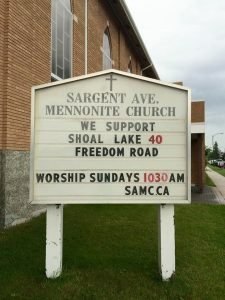 They’re all behind one of the websites, Churches for Freedom Road, where churches are posting photos of signs to support Shoal Lake 40. Trono spearheaded a 10-day campaign — the first of many, she vowed — that included a variety of responses. So far it’s included petitions, letters to Prime Minister Stephen Harper, thank-you notes to Shoal Lake 40, prayers, services, photos and even sales of murky water for a $1 a glass to fringe festival fans. Trono said Free Press coverage of the June 25 news event from Shoal Lake 40 was literally “the last straw” for her. “I’m not one of the people suffering but I’m tired of this stuff being done in my name. Do you know what I mean? I’m a Canadian, and I’d like to be a proud Canadian. I don’t want to be stealing water from people and leaving them to suffer,” she said. Meantime, Harp is a third of the way through a 60-day crowd-funding campaign to raise $10 million to build the road through private donations. “All credit to Shoal Lake 40 for keeping the media spotlight on this. I just found myself swept away by emotion on this. In some ways that’s how a lot of things get started, right?” Harp said. Three weeks into it, more than 700 donors have pledged $75,000. “Given the nature of the comments, ‘A first payment on a lifelong debt,’ it’s Winnipeggers, but it’s not just Winnipeggers giving,” Harp said. “Some people are motivated by the glaring injustice wherever they may live and others, like me, don’t feel they can sleep at night knowing where we get our water means those who supply the water have gone without,” Harp said. For the three organizers, the tipping point was the community’s reaction to the latest federal rejection, but the feeling is way beyond political. “I saw the video of the elder and the children crying and huddled in an embrace against hopelessness and something in me just kinda went off,” Bell said. “It’s about human rights and being pro Canadian. “In the last couple of years, following the Truth and Reconciliation Commission, as a white male and as a Christian, it’s been really hard to know how to respond,” Bell said. The chief figures if the road to reconciliation for indigenous people and non-natives means a real road for his people, over something as fundamental as water, there’s something powerful and universal at play. “It’s like a tsunami, it’s going across Canada. It’s really something. Maybe Shoal Lake can be that model of the road to reconciliation. 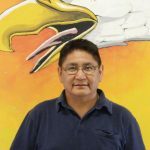 We have a huge opportunity in front of us and citizens in Winnipeg are creating that awareness,” Redsky said.